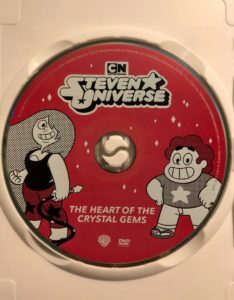 I was elated to hear we’d be getting another Steven Universe DVD, and one so close to the release of the main episodes included. 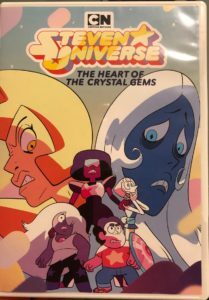 “Steven Universe: The Heart of the Crystal Gems” arrives on August 14th and features some of the most incredible episodes of the show with some gorgeous cover and DVD art. Unfortunately this is again a DVD-only release, and one that’s fairly basic with no special features included. My favorite thing about this DVD is the external art. The cover is a gorgeous image of Steven, Pearl, Amethyst, and Garnet surrounded by the giant heads of Yellow and Blue Diamond, very representative of many of the episodes within (although not really getting into the Ruby & Sapphire love arc at all). The DVD itself displays an image of Steven and Amethyst in a cool dot-stylized form. With its pink background, it looks fantastic. I wish I could say I liked the aesthetic of the menus as much. Unlike the Steven Universe Season 1 DVD, the menu screens are lackluster. This DVD can definitely be described as bare-bones. The main menu has a basic layout with the theme song playing behind it. The other menus, closed captioning on/off & episode selection, have nothing playing behind them and similarly basic layouts. Maybe the most striking thing about this release is what’s lacking: any sort of special features. That can probably be explained by the proximity of the DVD release to the original airings, and it’s completely understandable that there wouldn’t be enough time to include them, but as someone whose primary interest in DVD releases is special features, it’s definitely disappointing. Also disappointing is no corresponding Blu-ray release, but that’s nothing new for Cartoon Network DVDs. 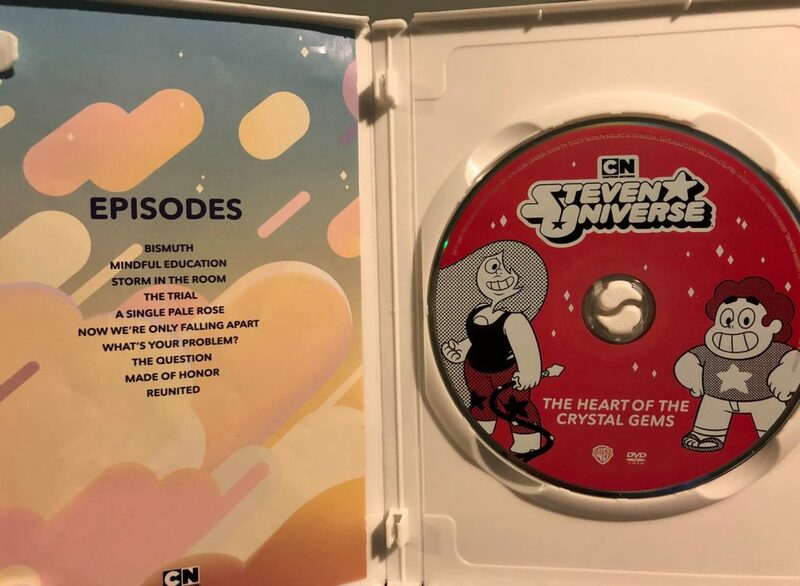 It’s hard to recommend “Steven Universe: The Heart of the Crystal Gems” universally, but dedicated Steven Universe merchandise collectors will definitely want to get their hands on it, as well as people who just want to rewatch these incredible episodes in DVD format.